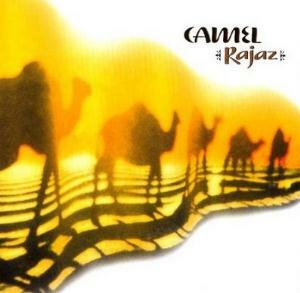 'Rajaz' is the thirteenth studio album of Camel and was released in 1999. The album was considered by both, fans and critics, the return of the band to their original form of music, their original roots, the return to the good old days. 'Rajaz' is a kind of poetry that was sung on caravans during the desert crossing to the rhythm of the camel steps to keep the travellers awake. In contrast to their two predecessors albums, 'Dust And Dreams' and 'Harbour Of Tears', 'Rajaz' isn't a conceptual album. Except in the title track, the theme is only taken up in two other songs, 'Sahara' and 'Lawrence'. Correspondingly, the songs here are more separated, instead of flowing into one another, as happen with the conceptual albums. Musically, 'Rajaz' is nevertheless coherent. The songs aren't really overly complex, and instead, the emphasis is placed on the atmosphere. This was particularly successful on the title track, which in its slow and uniform rhythm, allows the loneliness and strains of the travellers in the desert to be comprehended. Contrary to the earlier Camel's albums, the songs are dominating on 'Rajaz', because only two tracks are instrumental pieces. The line up of the album is Andrew Latimer (vocals, flute, guitars, keyboards and percussion), Ton Scherpenzeel (keyboards), Colin Bass (bass guitar), Dave Stewart (drums and percussion) and Barry Phillips (cello). 'Rajaz' has eight tracks. All tracks were written by Latimer except 'Three Wishes', 'Lost And Found' and 'Lawrence' which were written by Latimer and Susan Hoover. The first track 'Three Wishes' is an instrumental piece, very solid, very intriguing and exotic, which make of it a brilliant opener for the album. The song is very good and the instrumental tune changes for several times all over the song. It's very well performed and has one of the most beautiful guitar works made by Latimer. The second track 'Lost And Found' is another great song. It's a song with a good rhythm and with great combination between guitar and bass which makes an effect on the song pretty good. The song is full of great guitar work and it has also a fantastic keyboard work. This song has good vocal work too. The voice of Latimer is soft and with low timbre. It seems a new Latimer singing. The third track 'The Final Encore' is another captivating piece. It's another song very well sung and it has clearly the influence of the oriental music, making of it a song with an exotic sound. It reminds me the historical time of the Ancient Egypt. It has also interesting organ and guitar works. The fourth track is the title track 'Rajaz'. This is another great song of the album, very temperamental and full of feelings, what gives to this album a certain extravagant ambience and a unique character. It's a very calm song with a very beautiful beginning performed by Latimer's acoustic guitar and Phillips' cello. Latimer's voice is really good, nice, and dreamy and is very relaxing, too. The fifth track 'Shout' is a nice ballad, once more very well sung. It's a song quite different from the other songs on the album. The song is pretty good but it hasn't anything special or fantastic to listen on it. It's perhaps the weaker point on the album, and I may say, the only one. The sixth track 'Straight To My Heart' is a song with a bluesy tune with a slow slide guitar in the style of David Gilmour, which isn't so surprising because Latimer is often compared with him. This is another song with a nice and calm starting, with great singing and beautiful acoustic guitar work. The performance of all musicians is very competent and the song has also a beautiful instrumental ending. The seventh track 'Sahara' is another instrumental piece and represents one of the highest moments on the album and is also the best instrumental track on it. It has wonderful guitar work with some great Arabic musical tones, what can be considered a tribute to the band's own name. This is another song that reaches completely the very special and exotic atmosphere of the all album, like 'Rajaz' and 'Lost And Found' do as well. The eighth track 'Lawrence' is a great ending to the album. This is a song with great and beautiful musical moments and nice guitar solos. Once more we have a song very close to the style of Gilmour with great feeling and good instrumental work. I really enjoy this song. Conclusion: 'Rajaz' is a very special album for Camel and for Latimer. Twenty three years have passed since Camel released their last great masterpiece, their fourth studio album 'Moonmadness'. So, this can be considered a historic achievement, because it's unusual a band from the 70's release a masterpiece so many years later. 'Rajaz' is a great album, very melancholic and that sounds with influences of the eastern music. It has great musical parts, especially the instrumental parts, and it has unexpected vocal parts too. We may say that Camel pays homage to their natural environment, the deserts and camels. This is perhaps their musical work in which the guitar of Latimer is more close to the sound of the guitar of Gilmour. 'Rajaz' is one of the best Camel's albums and is absolutely an essential piece. The sound is quite different from the 70's, but this is progressivity, and Camel is one of the few 70's progressive bands that still progresses in these days. Buy it, because this is pure Camel's music on its highest peak. It's highly recommended.